In an age when Google can provide instantaneous public information and images of anyone or anything - anytime and anywhere - it has become increasingly difficult to determine what is fact and what is fiction. One has to edit the plethora of data and description to find the true person/event underneath - and of course, the spectator, as judge and jury, also biases this interpretation of "true" personality and character to a large extent. The four artists in What's the Story? address this challenge, this pursuit of truth, in the divisions between public and private, real and imagined, exterior and interior persona, as well as the influence of autobiography on narrative in general - in a variety of methodology and media. 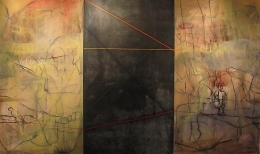 The "Back Story" - whether in graphic sketchbook form by Peik Larsen; video and sound installation by Black Lake; multiple narrative ink drawings by Max Razdow; or grand gestural abstractions in mixed media by Cesare DeCredico, is the subject and centerpiece of this provocative and beautiful four-person New Year's exhibition. Each artist tells his or her story in a variety of methods and media, never simply illustrating, always discovering. The Nebula series started in 2008 with Xerox transfers of Hubble imagery, primarily of nebulae and other deep space phenomenon. I found that by working into the abstractions found in these images with pens, I was able to draw a subjective voice out of the mysterious clouds of interstellar gasses. When I found a voice in the drawing, I wrote down what it was that was said, in a small banner within the drawing. The first drawing bore an aphoristic poem "From the hope of perfection comes the myth of despair." As the characters and ideas in the initial Nebula drawings started to take hold, a larger narrative began to form, which eventually spanned five years of changing ideas. Nebulas gave way to "Mists," which cast the celestial power earthward as abstractive powers, then mist created "Ruin," ruin birthed "Crystal," and so on. These discrete collections or way-points in the unfolding tale I called "Cycles," to keep them straight, though certainly each individual drawing contains massive slippages between these primary forms. Eventually, what had unfolded was a meandering epic, pressing a kind of Romantic sublimity through Modernist hopes ("Crystal") that birthed the digital ("Binary") and post modern ("Fire"), unfurling finally into a sort of reborn humanism ("Face") that ended as the infinite ("Eye"). When I have looked back over the nebula series as a whole, it has become something like an astrological chart, but also a linear narrative that traces both history and implied future spaces. "The Interludes," which I created in 2012 when I realized the series was finally wrapping up after five years, became a way to retrace my steps. The Interludes catalog the overlaps of the 8 Nebula series cycles as they segue into one another, and became a way to further expand on the temporal movements that lurk and move forward this oscillating mesh of symbol and association. We are constantly being bombarded by images and information, which I believe, as a whole, is unnecessary	and unimportant. How do I, as an artist and as an individual, find a true image and true information? My work is about finding this true image. Through breaking down images and information around me to simpler forms and colors and reforming them into my own vocabulary	of images and marks, I am understanding and decoding the world around me. With this vocabulary of images and marks I am able to have conversations with viewers. In a similar vein, Peik Larsen channels both old master approaches to printmaking and intaglio with sublime limited edition bookmaking techniques to transport and convey his visionary story-telling. Like the 19th century English landscape prescient, Samuel Palmer, Larsen conjures up a unique landscape which crosses both time and geographical boundaries, opening a quiet meditative window on the human experience where the viewer can suspend disbelief for a short, spiritual while, and enter a pastoral utopia of thought and feeling. 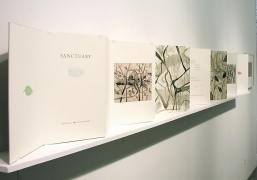 His chronology of bookmaking, displayed here in full (Sanctuary, Shades of Home, Landscape, and Sketchbook among the highlights) harkens to an age where journal and sketchbook were the primary means of communication and recording experience, and the medium was literally the message. His hand-on, tactile graphic craftsmanship leads a gentle path through his travels and ruminations on the more peaceful and introspective aspects of human existence. Finally, Black Lake enthralls and mesmerizes visitors to F+V once again with their multimedia sideshow of small painting, abstracted elemental video, and crisp, pared-down psychedelia, enticing the willing participant in a sort of total sensory levitation. Black Lake, formed in 2009, is comprised of Susan Jennings and Slink Moss, and has collaborated to produce over a dozen multi-media art installations, including “Flutter,” “Gray Rainbow,” “Snow,” “Bloom,” “Seek” and “Toasting the Trees.” They have installed and performed everywhere from the RISD Museum, Freight+Volume, David Nolan gallery, the X-Initiative, the Elizabeth Foundation for the Arts, and the Wooly (hosted by Invisible-Exports and BOMB Magazine. Black Lake sound art is featured on the soundtrack of Pip Chodorov’s documentary film “Free Radicals: A History of Experimental Film,” which won a public choice award at the International Film Festival Rotterdam, 2011. 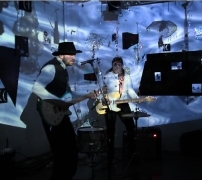 Black Lake received a residency this past summer at DNA in Provincetown, MA. Cesare De Credico was born on June 27, 1983 in Providence, Rhode Island, where he attended Rhode Island school of Design for Painting and graduated in 2005. He still lives and works in Providence. This is his first exhibition at Freight+Volume. 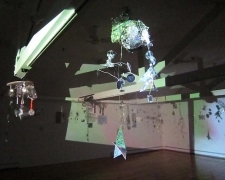 Since 2009, Black Lake (comprised of Susan Jennings and Slink Moss) has collaborated to produce over a dozen multi-media art installations with performances including "Gray Rainbow" (2011), “Snow” (2011), "Bloom" (2011), "Seek" (2010), and "Toasting the Trees" (2009). They have installed and performed in art venues such as The RISD Art Museum, Freight+Volume Gallery, David Nolan Gallery, X-Initiative, the Elizabeth Foundation for the Arts and The Wooly hosted by Invisible-Exports and BOMB Magazine. Peik Larsen studied art at Middlebury College and the San Francisco Art Institute, and received an MFA from the School of the Museum of Fine Arts/Tufts College graduate program. He has worked as a professional printer at Fox Graphics in Boston and Via Santa Reparata in Italy. He shows his paintings, prints, and books at Victoria Munroe Fine Art in Boston, DNA in Provincetown, and Freight+Volume in New York City, and is in many collections in this country and in Europe. 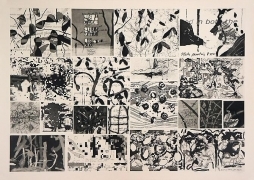 For many years he taught printmaking at Harvard and has been a visiting artist and critic at New England art schools. This is his second exhibition at F+V. Max Razdow was born in Boston, Massachusets in 1978. Recent solo exhibitions include Future Myths of the Surface (2011) and We Wait as Banshees Wait (2010) at Galerie Jan Dhaese in Ghent, Belgium, and Dusk Drawings (2012) at Trailer Park Proyect, San Juan, Puerto Rico. In 2013 he will present a solo booth at VOLTA NY during Armory Weekend with Galerie Jan Dhaese. His work has been included in the group shows Take-Out (2011) at Andrew Edlin Gallery, That Sinking Sense of Wonder (2012) at SouthFirst in NYC, The Double Dirty Dozen & Friends (2012) at Freight+Volume, and Bad Moon Rising 5 (2010) at UKS Oslo, among many other exhibitions in the U.S. and internationally. Razdow's work has been discussed in the New York Times, Art Fag City, L Magazine and KunstHart (BE), and included in K48. He has published critical writing in ArtUS and elsewhere, and co-curated EPIC (2011-2012), an exhibition of NYC video art for multiple venues in Belgium. In 2011, he was a resident of the Hafnarborg Museum in Hafnarfjörður, Iceland. 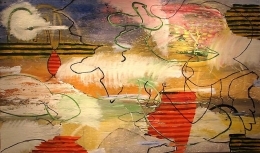 His art is held in collections in the U.S., Canada, Puerto Rico and Belgium. Max received his MFA from New York University in 2008 and a BFA from the University of Wisconsin-Madison. He lives and works in New York. Please join us for a public reception with the artists celebrating the opening of What’s the Story? on Thursday, Jan 17th from 6-8pm. For more information please contact Nick Lawrence @ 212-691-7700 or nick@freightandvolume.com.